In a recent post I ranted somewhat about the use of primary sources. Well sources don’t come any more primary than the recent discoveries of Wildeana that were made at the Free Library of Philadelphia prior to the Oscar Wilde season early this year. Some time ago the library released the new manuscript fragments of Canto III of The Ballad of Reading Gaol by Wilde with his comments; and the 140 page Wilde manuscript notebook of many draft poems and sketches. Now it’s the turn of the only known typescript of Wilde’s French play Salomé which had just been uploaded. This discovery identifies for the first time not only the moment at which Wilde developed Salomé’s dance into one with seven veils, but, potentially, it is also the historical origin of such a dance. If great minds are not already at work on this conjunction they will be when I get around to it. 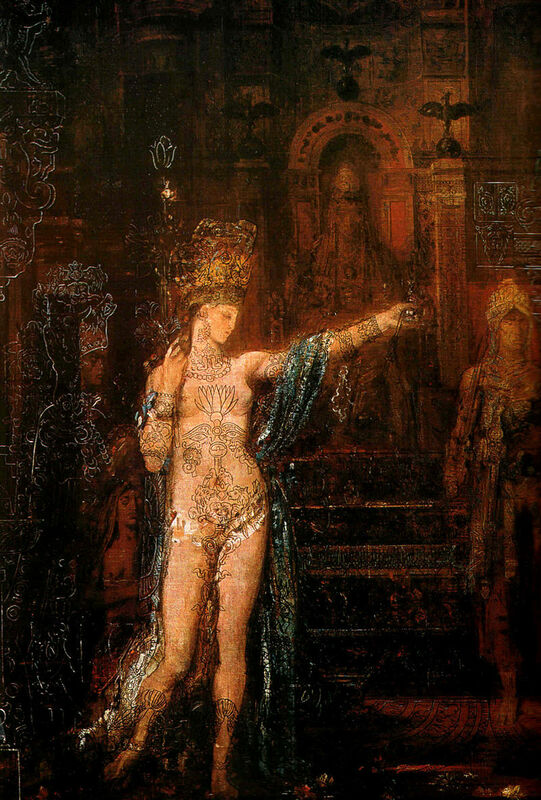 Gustave Moreau’s 1876 Salomé dansant devant Hérode (Salome dancing before Herod) descriptions of which in Joris-Karl Huysmans’s À rebours (Against Nature) had stimulated Wilde’s interest in the subject. What is an “Oscar Wilde season”? Your walking tours? No, winter’s a-coming in. Theatre season? Hopefully it’s not similar to a stag-hunting season – poor Oscar has been over-hunted already, eh? I’m looking again at “The Queen’s Agent,” a bio of Francis Walsingham by John Cooper who – another multi-leveled coincidence, palely echoing your multi-faceted ones – also “co-edited the catalog of the “Henry VIII: Dressed to Kill exhibition at the Tower of London.” It is really an excellent book. Thanks again for the Holland video. Perhaps I will turn him on (the sound, I mean) tonight. The Oscar Wilde season is the name I coined for the series of events, some coincidental, some planned, relating to Oscar Wilde that were held in Philadelphia earlier this year. It is a pleasure to see acknowledged once again the presence of Oscar Wilde’s typescript of Salomé among the holdings of the Free Library of Philadelphia. I feel fortunate in having been able to have a look at it there last winter and then to have obtained an early copy of it, while the splendid exhibit that included it was still on at the Rosenbach Museum & Library a short distance away. This access enabled me in a timely way to write up my discoveries relating to it for publication in the Times Literary Supplement last month. If you are interested in seeing what I discovered about it, you’ll find it as “Wilde in France,” TLS, September 11, 2015, 14-15. I would be pleased to hear from anyone who has further information about it or a response to my argument identifying the place of the typescript in Wilde’s working life.